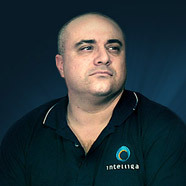 Adam is Managing Partner of Intelliga, a boutique marketing and software development agency with an international outlook. Adam has specialized in clients connected by a rare level of expertise, vision, and passion shared with their consumers. Adam enthuses about cars, good food, laughing out loud at movies, and thoughtful TV. He enjoys books, and rarely has enough time to read. He is a persistent contextualiser. Adam has three given names and is a champion amateur talker despite inherent reservations. He chatters excessively about history, branding, and toys of one sort and another. Adam is a designer sadly lacking any ability to draw – good thing it’s not his job. At least half of everything he says has missed its mark if no one laughs. With Intelliga, Adam has worked in a variety of verticals. Most of his engagements have been focused on increasing brand equity through definition and promotion. In relation to this, Adam has participated in content and product development in the fields of Web-enabled CRM, communications, and organizational software, online magazines, and mobile applications. Links to some of the companies Adam has advised can be found here. Adam rode from academia into business for reasons more concisely explained in person. He likes to travel both virtually and actually. His second favorite mode of transport is by water. A romantic at heart, with a love of architecture and gardens, Adam nonetheless tends to see things strategically, seeking out patterns and connections but not conspiracies. TEDxTimesSquare represents Adam’s first work with TEDx conferences, to which he has been drawn by a deep interest in the development and flow of ideas. Prior to living in New York, Adam was raised and educated in England and Canada. Adam holds a Doctorate in history from the University of Oxford. Adam may well figure out what he wants to do with his life by the time he grows up. In the meantime, he is enjoying being a husband and father, and formulating opinions about almost everything, once he has some knowledge on which to base them. Secretly, he seems to enjoy helping people. and looks forward to speaking with you when the chance arises.